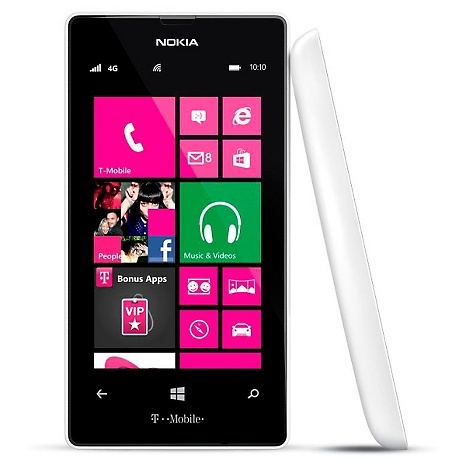 T-Mobile's Nokia Lumia 521 Windows Phone 8 launched today for $149.95. Until May 11 it's available exclusively from the Home Shopping Network. You can get it today from hsn.com. It should show up on the cable TV shopping channel tomorrow. The HSN deal includes free shipping and a free car charger. Starting May 11, Wal-Mart and Microsoft stores will begining selling the Lumia for the same $149.95 price. T-Mobile will eventually offer the phone online and in stores but isn't saying when and for how much. Based on the specs, the $149.95 price is a real bargain. The Lumia has a 4 inch 480 x 800 px screen that's reportedly exceptionally bright and sharp. There's a dual-core 1 Ghz processor and 512 MP of RAM so performance should be good. The 5 MP camera supports 720p HD video recording and there's a removable battery and support for memory cards up to 64 GB. The Lumia comes with Nokia Here Maps which offers turn by turn driving directions and works offline using maps stored on the SD card. That means that maps and drive navigation work without using data, ideal if you use the phone on T-Mobile's data-less pay as you go or PTel's pay by the MB PAYGO plan. Also included is Nokia Music for unlimited free mix radio. Does it take regular or micro SIM?? I wish Straight Talk got this on Verizon network. I would love to try a windows phone. In the text it staes that it will accept "memory cards up to 32 GB". Later it states "expandable up to 64GB with optional microSD card" which is the correct spec? 64 GB is correct. I've fixed the error. Thanks for pointing it out. will this model allow configure MMSC? Excellent value. If you want a flash, and a front camera for video chat, all in a slightly narrower phone, the 620 ($249 from Expansys in the US) is worth a look. Yes, the MMSC is user editable on all WP8 phones. Saw the T-Mobile Nokia 521 today at my local WalMart for $129.95. Funny--one of the staff came up to me as I was looking and told me that it runs on the Sprint network and won't get good reception where we live. My Lumia 521 just downloaded the 8.1 Amber update and I am waiting for the battery to charge enough to install it (Why? I am using the charger. Are they worried about power outages?). I am looking forward to some of the popular Nokia features, like turning the phone upside down to silence it, and double-tap the screen to unlock instead of searching for the power button. I heard thatMaybe that helps explain the lower retail price. AT&T 520 owners won't get all the new features due to lower video memory. 520 owners also have to wait a month for their update. OK; what next? My 521 took 10 minutes 'Preparing to Install' and now just sits there. What's it waiting for? A secret handshake? 100% battery, vs 36%? It's not saying. Waited 10 minutes, shut down, and got to wait another 10 going through 'Preparing to Install' again. Bad Windows memories are flooding back. No help from the Web yet. After another 15 minutes of staring at 'Preparing to Install...100%' the thing started the update and restarted. Then I just watched some gears on the screen right next to each other, turning impossibly in the SAME direction, both reversing ever so often. Only MSFT would think of that. This went on for another 8 minutes or so. Restarted again. 'Migrated Data', Steps 1-5 for a long while. Step 2 took forever. Phone is yelling 'ALMOST DONE' in a mod font now. Finally. Note: UPDATE COMPLETE is a lie. When you try to launch anything, it blares RESTART REQUIRED. So Windows. At least everything seems to work after the RESTART. Except I cannot text #BAL# to check my balance as instructed by Tmobile in their notification. PS: 'Preparing to Install' jammed at 99%, reverted to 95%, before completing. Second time it did the same thing. "Not a bug, it's feature" apparently. After all that, and I am not even running 8.1. Apparently I downloaded an interim OS update, 8.0.10328.78. Sorry, folks. 8.1 is starting to be pushed out today, but is not available for my phone yet, as implied in the article below. Nokia Support page and my phone say I HAVE the Amber update, vers. 3046.0000.1328.10255. Apparently Amber and 8.1 are different. FM radio works, but the 521, like the 520 does not have enough screen memory to run it. The Flip to Silence feature works by default - I like it. Gartner Group says Lumia Windows X phone sales increased more than 112% in the 2nd quarter, year over year. Nokia sells 80%+ of the Windows Phone 8 models.